Flax seeds (Alsi) are very nutritious and one should regularly have these in daily diet. 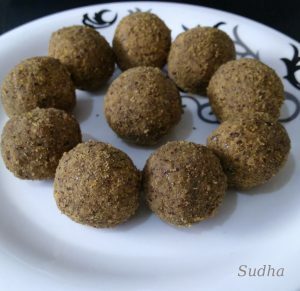 These laadoos are made using Chhilakewali Moong Dal (Split Green Gram with husk), Flax seeds, Jaggery and very less ghee. 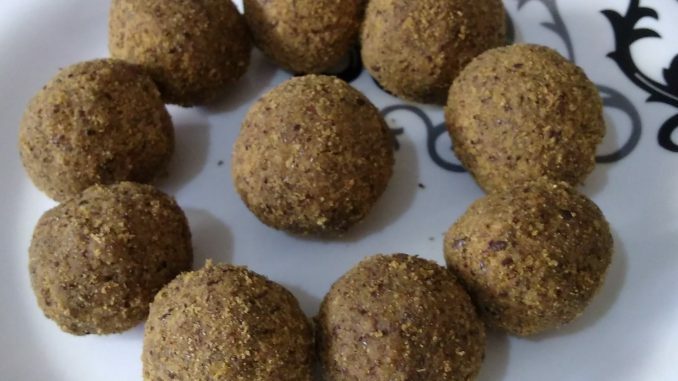 Try this quick and easy recipe of delicious and nutritious laadoos. This can be a good mid day snack for everyone in the family. 1. Dry roast Moong dal on low flame till light brown; and leave to cool. 2. Dry roast Flax seeds on low flame till they start to splutter and leave to cool. 3. 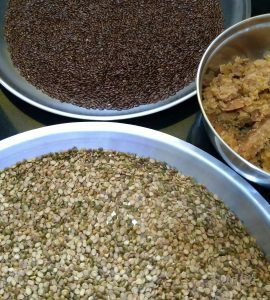 Using a grinder, grind Moong Dal into little coarse powder. 4. Grind Flax seeds also into little coarse powder. Flax seeds grind very fast. So be watchful. 5. In a pan, mix both powders. 6. 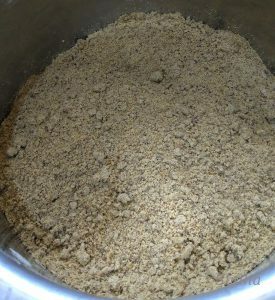 Grind Jaggery into a smooth paste. Check if your grinder can grind Jaggery ; since it’s sticky some grinders go bad while grinding jaggery. Alternatively you can crush Jaggery fine or grate it. Add it to the pan. 7. Mix the mixture. Add dry fruits of your choice, honey and cardamom powder. Mix. 8. Melt Ghee and add to the pan. Mix and roll laddus. This much ghee is enough to roll the laddus. But if you want, you can add more. अळशी खूप पौष्टिक असते. डॉक्टर रोज एक चमचा अळशी खायला सांगतात. अळशी खमंग भाजून जेवणानंतर बडीशेप सारखी खाऊ शकतो. खूप छान लागते. 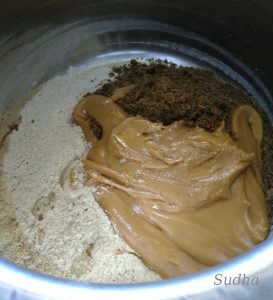 दुसरा पर्याय म्हणजे अळशी वापरून बनवलेला हेल्दी पदार्थ. ह्या लाडवात मी अळशी बरोबर सालाची मुगाची डाळ घालते. आणि गूळ, मध घालून लाडू बनवते. मध घातल्यामुळे तूप कमी लागतं आणि चव ही छान येते. मुलांना डब्यात द्यायला, नाश्त्याला, दुपारी चहाबरोबर कधीही खाऊ शकता. आणि हो, घरातल्या आजी आजोबांना ही आवडतील आणि खाता येतील हे लाडू. नक्की करून बघा. १. मुगाची डाळ मंद आचेवर खमंग भाजून घ्या. फिका तपकिरी रंग येईपर्यंत. २. गार झाल्यावर मिक्सर मध्ये बारीक करा. किंचित रवाळ ठेवा ; फार जाड नको. ३. अळशी मंद आचेवर खमंग भाजून घ्या. ४. गार झाल्यावर मिक्सर मध्ये बारीक करा . अळशी पटकन वाटली जाते. ५. आता गूळ आणि थोडे मूग डाळीचं पीठ (जे आपण वर बनवलंय )मिक्सर मध्ये घालून अगदी थोडा वेळ फिरवा. ६. दोन्ही पिठं , गूळ एका बाउल मध्ये घालून मिक्स करा. मध, वेलची पूड,सुका मेवा घाला. मिक्स करून थोडे थोडे पातळ तूप घालून मिक्स करा. लाडू वळता येतील एवढंच तूप घाला आणि लाडू वळा . ७. पौष्टिक लाडू तयार आहेत. हे लाडू १५–२० दिवस टिकतात. फ्रिज मध्ये ठेवू नका.